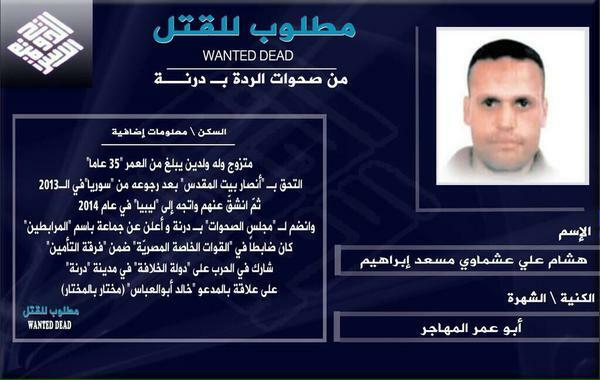 The Islamic State’s supporters claim that Hisham Ashmawi, who is wanted by Egyptian authorities for a string of assassinations, is in Libya. 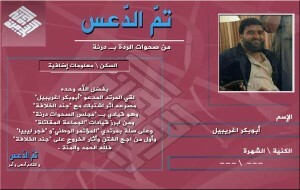 Ashmawi leads a group called Al Murabitoon, which is openly loyal to al Qaeda. 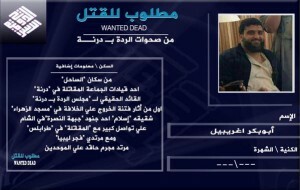 Jihadists connected to the Islamic State’s branch in Libya have released dozens of wanted posters online in recent weeks. The graphics identify the “caliphate’s” enemies, including the jihadists and Islamists who have opposed its expansion in North Africa. Many of the individuals shown in the posters belong to the Mujahideen Shura Council (MSC) in Derna, Libya. In June, the Islamic State’s arm in Libya moved against the MSC, killing two top leaders of the alliance. The MSC is a coalition of several jihadist groups, including the Abu Salim Martyrs Brigade (ASMB), which is firmly opposed to the “caliphate’s” goals in Derna. The MSC, which has ties to al Qaeda, delivered successive blows to the Islamic State’s men in the days and weeks that followed the outbreak of the fighting. Indeed, the Islamic State picked a fight it could not easily win. Some press outlets reported last year that the Islamic State was in control of Derna, but that wasn’t true. The MSC and its allies remain firmly entrenched and quickly routed the Islamic State from some of its strongholds in the jihadist-dominated city. Much of the current fighting between the two sides is taking place in Derna’s suburbs. 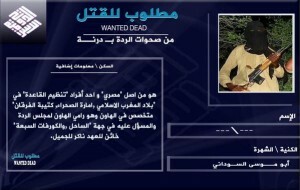 The Islamic State’s “wanted dead” campaign is part of its attempt to regain momentum in the conflict. Some key figures have already been targeted. Each time one is killed, the Islamic State’s supporters release a new version of the graphic, changing the format and color to signify his death. From an intelligence perspective, the posters may be valuable for international authorities seeking to track al Qaeda-affiliated jihadists in Libya. If the information on the posters is accurate, then the Islamic State’s supporters are divulging operational details concerning their jihadist rivals. 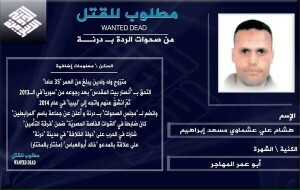 For instance, one of the “wanted dead” posters features Hisham Ali Ashmawi, a former Egyptian special forces officer who leads a group named Al Murabitoon. In late July, Al Murabitoon released its first video starring Ashmawi (also known as Abu Omar al Muhajir al Masri). The video makes it clear that Ashmawi, who reportedly is a former member of Ansar Bayt al Maqdis (ABM), is loyal to Ayman al Zawahiri. ABM’s Sinai-based leadership swore allegiance to the Abu Bakr al Baghdadi last year, but part of the group remained in al Qaeda’s camp. But if the Islamic State’s poster is accurate, then Ashmawi is fighting alongside the MSC in Derna. The caliphate’s boosters claim in tweets that Ashmawi is part of the “awakenings” in Libya. The Islamic State uses this term (“awakenings”) as a way to disparage its jihadist rivals, including the MSC, lumping them in with the American-backed tribes and fighters who battled al Qaeda during the height of the Iraq War. In reality, the MSC has nothing in common with America’s allies in western Iraq. 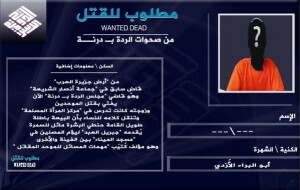 While it is certainly possible that Ashmawi is currently in Libya, The Long War Journal cannot independently verify this or some of the other details presented in the “wanted dead” campaign. Another one of the posters (seen on the right) released earlier this month shows Abu Bakr Ghrabil, who is described as one of the Libyan Islamic Fighting Group’s (LIFG) leaders in Derna and a key figure in the “apostate awakening council” in Derna, meaning the MSC. Ghrabil supposedly communicates regularly with the LIFG in Tripoli and the Islamist Fajr Libya (“Libyan Dawn”) alliance. After the fall of Muammar al Qaddafi’s regime, some senior LIFG members became involved in Libyan politics. The Islamic State believes this makes them apostates, but pro-al Qaeda ideologues have been more sympathetic to this course, seeing it as a way for the jihadists to advance their cause through other means. 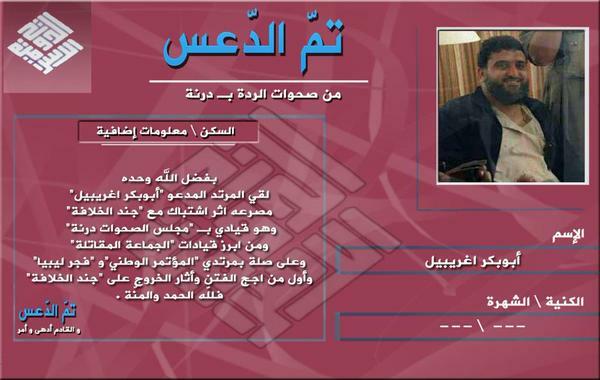 The Islamic State says that Ghrabil’s brother, identified as “Islam,” joined Al Nusrah Front in Syria. Al Nusrah, which is al Qaeda’s official branch in the Levant, is the Islamic State’s staunch rival. A follow-up poster (seen on the right) celebrates Ghrabil’s death, saying that he had been killed in clashes with the caliphate’s soldiers. Ghrabil was among the first to incite the population against the “caliphate” in Derna. 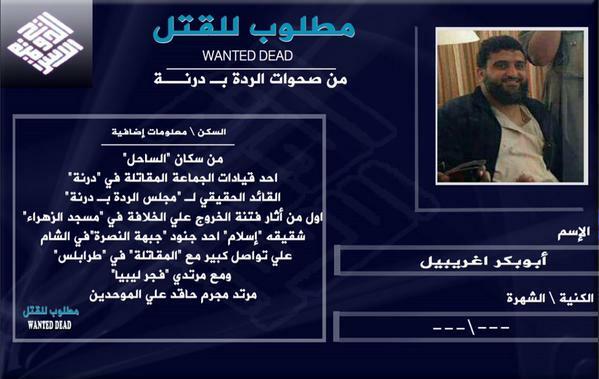 The Islamic State also claims that Ghrabil is tied to Libya’s General National Congress. A Twitter feed associated with the MSC says that Ghrabil was “the commander” and a “heroic leader” who was responsible for expelling the Kharijites (or extremists, meaning the Islamic State’s fighters) from Derna. According to this same feed, Ghrabil was killed on August 9. The Islamic State describes a “wanted dead” individual, known as Abu Musa al Sudani (shown on the right), as an Egyptian national who belongs to al Qaeda in the Islamic Maghreb (AQIM). It is not clear why he is called “al Sudani,” meaning he is from the Sudan, but it is possible that he spent time in that country. Al Qaeda was based in the Sudan in the early 1990s. The Islamic State says that Sudani is an “expert” in mortars and is “in charge” of the “apostate council’s mortar unit,” meaning a part of the MSC’s military wing. These are just some of the dozens of “wanted dead” posters published online in recent weeks. The Islamic State’s Libyan arm has identified a number of its foes, many of whom are serving the MSC and other groups in Libya in various capacities. Ahh, nothing like the smell of red-on-red in the morning! Go Teams! Thanks for letting me post. BTW, this website is often sited in Jihadi forums and websites although they usually add the disclaimer that it is a propaganda arm for zionist power in the US. “It is not clear why he is called “al Sudani,” meaning he is from the Sudan, but it is possible that he spent time in that country. ” Well, although many jihadists use a surname that indicates their origin (country) sometimes that is not the case. Al Sudani could very well be just a nick name – maybe signifying darker complexion and not necessarily country of origin. For example, a recently deceased (in his seventies i think) Al Shabab commander was called Al Turki (he is from central Galgadud region of somalia and has nothing to do with Turkey). Nick names such as Al- Habash (Ethiopian) and Al-Sudani are plenty in the Arab world mostly, as i have stated above, just mean dark skin. As for ISIL divulging operational info. on Al Qaida, I wouldn’t put much value into that. Any intel. agency tasked with gathering info. on them would already have such basic intel. If ISIL provided A.Q’s numbers, methods of communication, sources of internal and external funding and how these funds are transmitted to them or location of training camps, save houses for senior members, weapons depots, impending attacks etc – then it would be something to get excited about.